The Challenger 601 is a large private jet that caters specifically to traveler comfort. With a cabin width of 8.2 feet and height of 6.1 feet, the Challenger comfortably holds eight to twelve people, with the option to accompany 19. Despite the large cabin size, the Challenger 601 still retains a transcontinental range and the ability to travel 3,500 nautical miles nonstop. 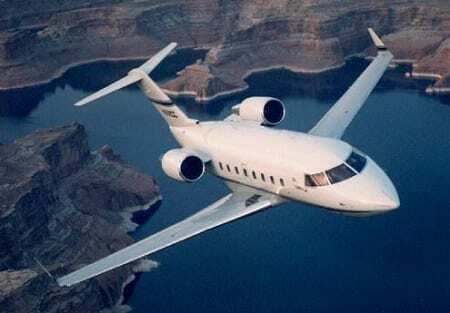 Powered by two General Electric CF34-3A engines, the Challenger 601 boasts a typical cruising speed of 488MPH and the ability to operate at 45,000 feet. If you require a large and spacious jet capable of cross country flights, look no further than the Challenger 601.